Finally, commercial production bidding can be easy to do! This specially designed program will produce bid estimates that conform with the industry standard format. It will actualize a budget anytime during or after production. Although this program was originally designed for commercials, it's constantly used for budgeting both hour-long and episodic television programming, documentaries, music videos and corporate productions. 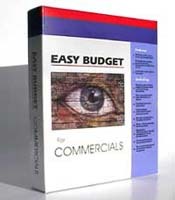 Click here to see a sample page of Easy Budget for Commercials. With Easy Budget you’ll create your production bids much faster than ever before. The industry-standard format means your bid will be understood and accepted by everyone. So easy to learn! 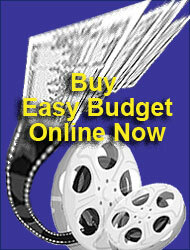 Easy Budget's clear and simple approach is actually a check list for budgeting any production. Every account line is a reminder, "Will I need this?" or "Did I forget that?" This means you can start creating accurate bids right away. Easily handles both estimated and actual costs. Our online labor database supplies all the important labor information you'll need - FREE OF CHARGE. Easily share your bid versions with others - no need to buy another $1,200.00 program. High quality graphics: Screened-in totals and sub-totals - print in color if you like. You can’t buy a better looking or more impressive budget. Works with the spreadsheet you already own. Applying fringes and other global values has never been so simple to do. There's no need to apply globals over and over again. Set a global value once and forget about it. Powerful enough to do your payroll too! Detailed totals and sub-totals are provided for every cast or crew member in every department. Easy Budget automatically applies and calculates all fringe benefits for any union or guild. Non-union shoots too. With just one mouse click! Unlike the more expensive programs, you can test for “what if” in seconds rather than hours.